Not my best work, but hey, it's done. A conversation with Portland's own @rmalena, a.k.a. "Nice Math Teacher!" 00:00 - promo: BANG 33 rerun +online! 01:48 - cats: better than math? 12:02 - how is a proof like a puzzle? besides the arguing? 19:28 - RPGs: impossible to put puzzles into? 24:05 - future events: bikes? Seattle? stay tuned! 25:22 - plug-o-rama: Pacific Crest Community School, Pathfinder Society, Geek Portland, Puzzle Hunt Calendar. If you think about it, just about every piece of unmanned exploration equipment we've sent into space--every rover, every probe, every satellite--has been sent out there to die. But that's okay. Because it's what they did before dying that's important. Jasper here, with more on Lady Grey's activities over Labor Day weekend! Like Tye, she seems to have something against flat rugs, and did her best to keep the rugs in the bathroom bunched up all the time. Fortunately, she left the one underneath her food and water bowls alone! Also, as you can see in this still frame, she is clearly aware of the presence of the webcam! Lady Grey is up for adoption. If you or someone you know in the Portland metro area would like to give her a good home, please contact the humans! 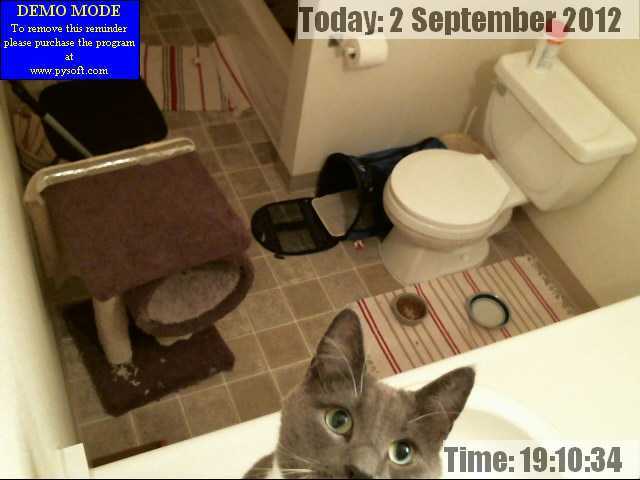 Today is Ignite Portland 11 Eve, and I just realized that I never followed up my IP10 blog posts with the promised video of my "Cat Feeding Robot" talk. Oops! To rectify that, below are not one, but two recordings of that presentation. I've archived links to both of these videos, the slides themselves, and MOAR at www.snout.org/foodrobot . I'm sure the current page does not fulfill everyone's cat-feeding-robot needs, so please, send me your suggestions for improvement! Finally, if you live in or near Portland, Oregon, you should come see IP11 tomorrow night. (And anyone on the Internet can watch the livestream; check igniteportland.org tomorrow afternoon for details.) As usual, there's a terrific variety of talks, this time including two different talks about gaming and two other talks about doing cool stuff without dying. What's not to like? * I actually gave this talk a third time, in between the two instances shown above, at the open-mic night on JoCo Cruise Crazy II. I don't think anyone recorded video of that, but you can see plenty of other videos from the cruise (and you should definitely join us on JCCC3 if you can!). The funny story there is that our hosts were not able to pull video from my computer to the big screens in the lounge, so I presented from my laptop (thankfully, one with a 17" display) to an audience sitting on the dance floor. I can honestly say that's an experience I've never had before, but it was just as awesome as the other two times. Jasper here, with a look at how Lady Grey did on her own for one whole weekend at the end of last month! This was the first full day the humans were away at something called PACKS, and she seemed to have a pretty good time eating, drinking, sleeping in various places, and playing with different things! In which we discuss the usual, plus Norse mythology. Jasper here, with a look back at the end of Lady Grey's first week with us! She was definitely getting comfortable--you can see her out and about, playing more, and eating more! Also, if you are curious, that's Ascension that one of the humans is playing on the i-pad! I do not really understand how this game works, but it looks like you play by swiping your paws across the screen, and that seems pretty cool! I can neither confirm nor deny that today's story was inspired in part by Terra Nova and The Light of Other Days. Jasper here, with another look at our house guest! On her fifth day here, Lady Grey demonstrated increased interest in playing, and one of the humans demonstrated that you can make a simple lanyard into an effective cat toy if you simply put a bird on it! Jasper here, with another Lady Grey retro-update! I guess she was still getting used to her new room on her third day with us, since she didn't do much except sleep. As shown here! Well, the big news there is that she found Tye's cat-carrier an acceptable sleeping spot! Though she still prefers to lie on the counter most of the time, which is why you don't see her on camera that much! Lady Grey is up for adoption. If you or someone you know in the Portland metro area would like to give her a home, please contact the humans! Just so y'all know: tomorrow's SnoutCast will be delayed by several hours, but we have some very special guests lined up. It'll be worth waiting for! Guaranteed! Or your money back. Lady Grey Cam, Day 1: There's a Lady in the House! Jasper here! As you know, we've got another house guest at the moment. Her name is "Lady Grey," and she's totally up for adoption! Not that Tye and I don't enjoy having a lady around, but she is somewhat less than enthusiastic about our attentions! You can see the humans attempting to take some photographs to show her off to prospective adopters, and then DeeAnn sits in the bathroom studying Mouse Guard (a game of which I do not approve) to keep Lady Grey company for a while. Later, our old perch (which, as you can see, is a bit worn out on the side) gets converted to a blanket-cave for Lady Grey's sleeping convenience. She spends quite a lot of time in there now! And that's it for her first day with us. Tye will be along later to tell you about her second day! TL;DR: Adopt this cat! Backstory below. Our household seems to have a penchant for attracting foster cats. Last spring, it was a stray kitten (who found a good home, thanks to WCGHS); and earlier this summer, on June 22nd, DeeAnn and Darla found a cat while on one of their morning walks. The cat was wearing a collar, so D&D canvassed some nearby houses to see if anyone had lost a cat. There were a couple of leads, but they didn't pan out. DeeAnn and I also put up some flyers around the neighborhood later. Those haven't generated any response either. "Lady Grey" stayed with Darla for two months, but her apartment complex doesn't actually allow pets, and they do threaten periodic inspections. DeeAnn also felt some responsibility for kitty, so on August 23rd, she took up residence in our guest bathroom. Of course, since we have the technology, we set up a webcam in Lady Grey's room to make sure she's doing okay. I'll be posting videos over the next few days and letting our resident boy-cats, Jasper and Tye, tell you all about our house guest. Lady Grey is up for adoption. Our local vet has certified her disease-free and estimated she's about five years old. If you or someone you know in the Portland metro area would like to give Lady Grey a home, please contact us! Though this piece was not directly inspired by the toothbrush that saved the ISS, it seems appropriate to mention that bit of news. I don't have an ending for this story yet (or much of a beginning, to be honest), but I'm working on it. This is an unofficial announcement, so don't make plans until you see an update on the OryCon 34 web site, but: I am running the Open Read and Critique (ORC) sessions again this year, but instead of a solid three-hour block of ORCs on Friday and Saturday, I'm splitting off the last hour on each day and moving it to nighttime. Why the change? Well, ever since I started doing this back in 2009, I've noticed that the final session on each day has been poorly attended. I've also gotten a few requests for late-night sessions, so that people who work the con during the day, or aspiring writers prefer panels to parties--and thus are freer after dinnertime--can also participate. I personally like to do a bit of party-cruising at cons, but I figured I'd try moving that poorly-attended third ORC session to 8:00 PM on both days and see what happens. The demand is certainly there for the earlier sessions, and people have even asked about having Sunday sessions; but I'd like to see how this modification goes before considering additions. Anyway, official info should be up next week, and you can e-mail orc@orycon.org if you have any other questions. Hope to see you in November! 20:29 - run more Games?